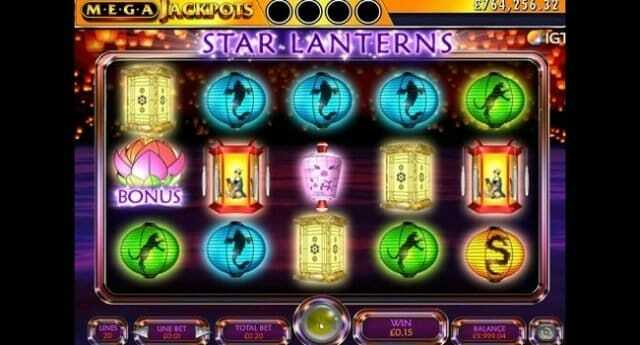 Mega Jackpots Star Lanterns is 5 reels and 20 payline slot game developed by IGT. This is a progressive slot game which has 3 bonus rounds. The free spins bonus feature will provide you 4 to 14 free spins and up to 5x of multiplier. The most paying symbol of this slot is the yellow lantern. It will offer you 50 times of your total stake if you hit 5 of these symbols across a payline. The floating reel feature of this slot will be triggered when you land on a winning combination. The floating reel will create winning combinations and it will burst and disappear until you get a winning combination. The floating reel feature can be triggered during base game as well as during free spin bonus feature. The game also includes a Star Multiplier feature. In this feature every star will get you 2x, 3x or 5x multiplier and this feature can run in base as well as free spin feature. The most important feature of this game is free spin bonus feature. This feature will be triggered when you land 3 Bonus scatter on reel 1,2 and 3 and during this you can get 4 and 14 free spins. This Mega Jackpots Star Lanterns slot can be a life changing game for you. You could easily win biggest jackpots of your life while playing at this slot machine.